In Imaris you can view and interact with large datasets within seconds. 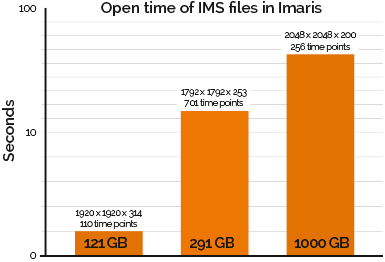 Simply download the FileConverter, convert your existing dataset to IMS and test the speed of Imaris' rendering with a free trial of Imaris 9. ImarisFileConverter's redesigned GUI and batch conversion efficiently convert multiple large datasets to save you time. The resulting ims files can then be opened very quickly within Imaris. Conversion is multithreaded (the number of cores selected by the user). Files dropped to conversion queue and are processed with a single click. The IMS file format stores a multi-resolution image pyramid in 3D block-wise layout using HDF5. The renderer loads optimal image resolution levels to match screen resolution. Data Caching on the GPU and in RAM improves performance significantly. Data are stored in a lossless compressed format to save storage space. Multi-threading of rendering and data decompression and upload facilitate interactivity. NEW Imaris 9 searches the file reader plugin directory for DLLs that have the FileReader API. If the file format contains multiple resolution levels Imaris will quickly render those files in native mode. The new Surface rendering technology in Imaris 9 adopts Imaris' proven Volume rendering technology based on a multi-resolution octree. Now it's possible to visualize Surfaces of hundreds of Gigabytes in size. With this technology Imaris 9 can interactively render massive Surfaces consisting of billions of triangles. Imaris 9 computes Surfaces in a block wise and multithreaded fashion to efficiently analyze large images (hundreds of Gigabytes). Thanks to this ground breaking new technology the computation will be possible for big images and will be significantly faster than in previous Imaris versions. Our test images for Surfaces calculation time presented below are multiples of Wasp_embryo.ims created by using "Add slices" in Imaris. System specs: Win 7.1, 192GB RAM (Imaris internal memory limit of 64GB), CPU Intel Xeon E5-2687 (x2), Graphics Nvidia Quadro k5000, Data read from HDD, Cache set to SSD. With the launch of our patented Torch™ tool, both Autopath and Autodepth tracing methods in Filament Tracer have been significantly improved to efficiently trace neurons in large 3D images and dense networks. This patented solution brings a novel volume visualization approach to tracing, making is faster and more efficient than ever before. Highlights structures in close proximity to the tracing cursor. Facilitates tracing in dense neural networks. Fresh functionality has been added to the Autopath tracing method to be optimized for large 3D images, greatly improving speed and efficiency. Tracing can start immediately after selecting a starting point. Tracing can be paused and restarted easily from the same point. Filament diameters automatically calculated during tracing. Depth visibility enables selection of dynamic region of interest for tracing. Autodepth now makes drawing filaments much easier, and introduces improved support for large 3D images. Autosnap allows automatic 'snapping' to nearest filament even when mouse pointer is not centred. Drawing 'backwards' will erase parts of the traced filament in case of incorrect path choices. Autopan will enable the continuous drawing along filaments outside of the initial view.